Tomorrow night we at CCdd are sad to see our hit production of "Bearded" fly away in its sled...but sadly it's just time. We are floored that this production took off in the way it had. Rave reviews, packed audiences, and a whole lot of love from our community. BUT! There are a handful of tickets left for tonight and tomorrow- and we want it to sell out! So, this is a list of why you should make it a point to get to "Bearded" before it's gone! Critics agree- this is a group of artists on par with SNL for their abilities to change a character as quickly as their clothes, and their stellar comic timing that never drowns out the most poignant moments in the production. Missing their stellar performances should be a crime. The cast bows. By Rich Soublet. #2 Patrick Kelly created a piece that will put the modern Holiday spirit in your heart. We didn't know if it was possible- but we wanted desperately to create a play that was able to tell a tale about modern/real Christmas magic. And honestly, with a subject like Mall Santas, most of our audiences assumed we'd go for crass or anti-Christmas. That was never our hope, and with a collection of compassionate Mall Santas as interviewees, and with Patrick Kelly at the helm as Director- something magical did happen with "Bearded". We don't want to give it away- but Patrick Kelly took heart to the message of this season, and if you're looking to put your Christmas pants on- we're here to help make that happen for you. Director Patrick Kelly at work. By Rich Soublet. #3 Because you want something different. "Bearded" originated because we wanted to take a crack at the seasonal trend of Holiday Productions. Audiences love this season, and so do we! "Bearded" is an entirely new Christmas story, and according to many of our critics it holds its' own compared to many of the classics you've come to enjoy. We hope you'll open up to a new tradition this season with our enchanting and heartfelt show. "All I want for Christmas is something new to review. Well, wish granted, thanks to the emerging theater company Circle Circle dot dot." - David Codden, San Diego CityBeat. #4 Because you want CCdd to stick around. We're so happy to kick off our 3rd Season with such a strong show as "Bearded". Every show we make builds and improves from the last. 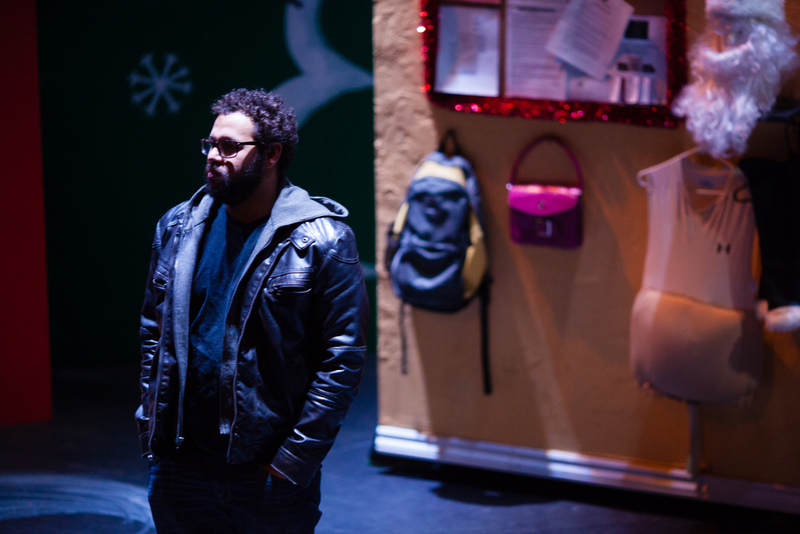 Pam Kragen from U-T San Diego states that "Bearded is one of the strongest shows to date for the young, promising theater company." The only way we can grow is by continuing. The only way we can continue is if audiences keep showing up to our productions. While "Bearded" has been one of our best-selling shows in our history, we still have a long way to go to be on-par with the local playhouses, and in reaching our goals. So grab a friend, and come to "Bearded"! We do suggest grabbing those last-minute tickets online to avoid being turned away from a sold-out house- but we do hope you all make it out.